Another addition to my occasional, songs that could be picture book series. I'm not entirely sure this one would work as a picture book but it's a fun tune and who can resist a bit of Cribbins? 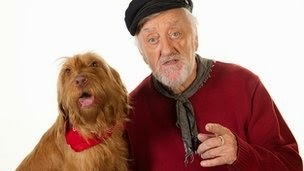 Bernard Cribbins has been famous for several generations of children. From the Wombles in the 1970s to Old Jack's Boat today, with story telling on Jackanory, Dr. Who, Worzel Gummidge and so much more in between. In the 1960s he recorded Right Said Fred. Like quite a lot of classic British comedy songs Right Said Fred was produced by The Beatles' producer George Martin. The removal men in the song are reminiscent of Laurel & Hardy's delivery men in their Oscar winning film The Music Box. The now iconic Cribbins had a hit with the song in 1962, almost 30 years later it spawned the name of the pop group Right Said Fred. Anyway Right Said Fred, here's an animated version in Lego!